Published: 2014 - Henry Holt and Company. Check out Di's review HERE and Uma's review HERE!! Uptil now, I wasn't loving the Grisha trilogy. I was finding it unremarkable, rather boring, and completely mediocre. But this book seemed to have come from another author entirely: the real Bardugo, the genius Bardugo, the Bardugo that blew my mind with the brilliance of Six of Crows. This final book absolutely won me over. Everything flies to a whole new level in Ruin and Rising. The plot's extremely unpredictable, the dialogue's rich, profound, and witty, and there are so many amazing, strong, poetic scenes that if this had been a movie I would've called it "excellent directing." I especially love the scene where Alina and all her girl friends come together on the ship and start discussing the clothes Alina's been given to wear. It's such a beautiful scene because it gives us a powerful sense of humanness and friendship; between the girls, which we haven't seen much of. The story's fast-paced and never boring. The plot's tighter, motivations clearer, and the frequent action comes thick and sharp. Every aspect is heightened to a new level of genius, and I was desperate to keep reading. The characters improve drastically. There's some incredible character development for particularly Alina, Mal, and Genya, and fantastic friendships and relationships are formed between the huge cast of characters. I loved Alina's squad/gang, and I adored the interactions between everyone. Personalities spring vividly to the surface, and everyone just becomes so much more defined. Alina's a truly wonderful heroine, and it's in this book that I really found myself rooting for her. She's so incredibly human, and looking back over the previous books I can now fully appreciate her amazing growth. I also loved the way the romance went: unpredictable, realistic, and satisfying. Mal and Alina grow so much throughout the novel, and it's wonderful to see their relationship develop as well. 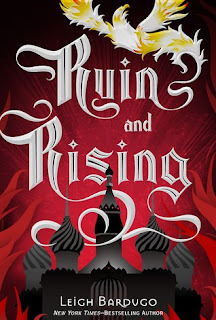 I almost want to say skip the first two books and just read Ruin and Rising, which isn't a good plan because then you'd be totally lost. But this book is so much better than the others, in every aspect, and it's almost worth sticking through the previous books to get to this sparkling and exhilarating gem. So glad this one was a hit for you and that the trilogy ended even stronger than it started! I really hope to read this before the end of the year. Great review, Amy! It's always bittersweet to read the ending of a series and that's how I felt when I was reading this conclusion. Yes, the characters have developed a lot, and it's impossible to predict what will happen in the end! I was satisfied though. I'm looking forward to going on to read the duology now. The duology is AMAZING!! Hope you LOVE that! This book is my favorite of the entire trilogy! In fact it's my favorite book of all time, as of right now. I'm so glad that you enjoyed it as well.